I love cookies. And Diet Coke, bread, cheese, wine... ok I love food in general. The kitchen is my happy place. As a result, my favorite things to wear tend to be forgiving. So, this new sweater design is just the thing! Trailing Lace is a stunning blousy drop-sleeve pullover that works with whatever you happen to eat that day thanks to the generous 10-15" of positive ease. I am also very into details. 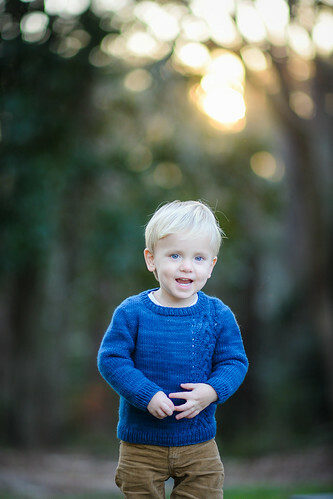 This sweater is worked from the top down and features an asymmetrical lace-cable panel. The repeat is easy to memorize and even if you've never ventured into this type of stitch pattern, you will catch right on. There are also just a handful of short rows at the bottom to give a slight hi-lo hemline. I am a big fan of a little extra backside coverage. These short rows are quick and easy, so don't be nervous even if you haven't tried them before. Directions are included in the pattern and it is a great opportunity to learn. The delicate neckline is somewhere in the grey area between crew and boat. I wanted it to be wide enough to be springy and breezy but still wanted to fit in the lace-cable panel in full width at the shoulder. I had a wonderful group of knitters that worked with me on a preview knit for this design, you can already check out a myriad of beautifully finished sweaters in other colors and yarns on Ravelry. While you're over there, you can add the pattern to your queue. In my sample, I used YOTH Yarns Big Sister in Shiitake. This yarn has beautiful drape and stitch definition. Veronika took these beautiful pictures of her daughter Jasmine for the design and I love how she styled it. Leggings and boots would be great with it too if you're wearing it through the winter in a cold climate. If you feel like you've seen something similar to this from me before, you might be thinking of Winding Trail. The construction and cut of the adult sweater is completely different but the stitch patterns are very similar. Trailing Lace was inspired by Winding Trail just like the designs from my last book Grown were inspired by other Tot Toppers designs. I find that once I get a look I love, my brain really enjoys adapting it for different audiences. You can totally mommy & me this set. I'm heading out to Stitches West next week for the third year in a row! You can come see me along with this sweater along with lots of other samples in the YOTH booth. I would love to meet you and to help you pick out some yarn for your next project. 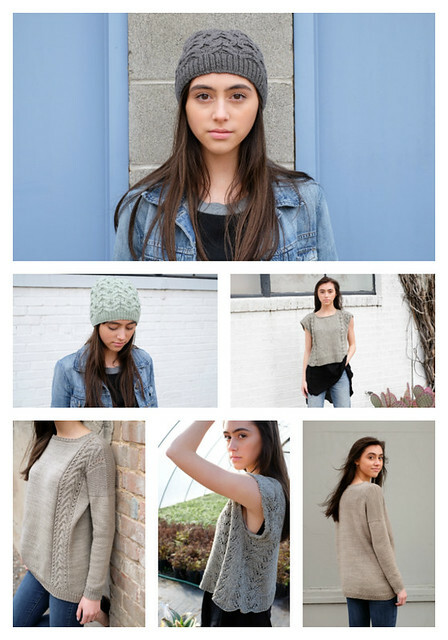 :) Trailing Lace was part of a trio of patterns released for YOTH at Stitches; take a look at Thea Colemans gorgeous Agave (hat) and Reposado (tank) designs in the collage below. They will be at the booth too although sadly Thea won't be there this year. After Stitches, I'm really thinking about starting a KAL for this design. It has been a while since I've hosted a KAL and this one is so tempting since there might be a few folks out there that need some encouragement to try cabling or short rows for the first time. If you'd be interested in a KAL, make sure you are on my mailing list so you'll be notified. Or join up in my Ravelry Group to see all the latest goings-ons on regularly. Thanks for reading all about my latest design, I would love to hear what you think of this sweater. Leave me a comment, come see me at Stitches, or visit me on instagram!